Squally, squishy, skewed. Those three words describe the last 24 hours all too perfectly. It all started with a mini-squall containing just enough wind and rain to be refreshing. It has been months since we have seen rainfall. Despite a good fresh washdown with the hose in Mindelo, the boat rigging was still covered with fine red sand from the Sahara picked up in Morocco, The Gambia and the Canary Islands. The decks were also salty and scattered with the residue of unfortunate flying fish and squid. So during this first mini-squall Seb and I ran outside in delight, took advantage of the rain to have a outside shower and delighted in the unusual cleanliness of the boat. But as they night progressed the squalls became more frequent, the winds higher and the rain torrential. We clocked wind shifts within seconds of 60 degrees and the wind developed in minutes from 15 up to almost 40 knots. Although squalls are always a threat here and we keep a good watch for them this was something more intense and had not been picked up in our forecasts. Seb downloaded an updated weather chart and saw a large trough had moved further North West that expected and caught up to us. So with the help of the radar giving us heads up on rain activity we spent the night dodging the worst activity and came through the night tired but fortunately unscathed. 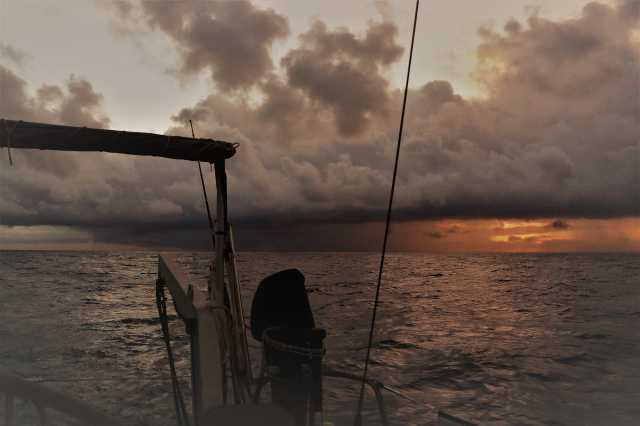 And the morning brought calm waves and clear skies and we started again to have stable winds and are making good progress.